Sending Light: Reiki Light Bridge for Healing is an evolution of Reiki distance healing. Intended for the highest and best good, Divine Light energies are sent to the user who actively chooses to receive these beautiful energies using modern technology as the bridge for healing. 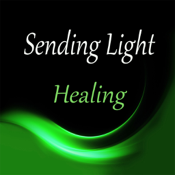 Along with color, light, movement, and sound healing music, this app has been created with an energy track, filled with Reiki Divine Light and Love. It is recommended that you place the Reiki Light Bridge device (phone, iPad, etc.) on your heart, at the top of your head, or any place you feel discomfort, pain or stress. These sessions may also be helpful in clearing inanimate objects of negative energies or restoring calm to your environment. As with all energetic healing, it is recommended that you state your specific intention beforehand. Reiki (pronounced, ray-key) is a Japanese technique for stress reduction and relaxation, which promotes healing on the physical, mental, emotional, and spiritual planes. Reiki is a bridge of Divine Light and Love, administered by “laying on of hands” and light touch, with the intention of healing for the highest and best good. In this case, the “hands” come through the technology. This app is not intended to replace medical treatment. In case of illness seek assistance from a medical professional.